"Logic is a little tweeting bird chirping in meadow. Logic is a wreath of pretty flowers that smell bad." This is another comic Star Trek episode and provides some genuinely humorous moments. It is interesting how they could turn around and do an episode full of gags and be funnier than shows or movies that attempt to parody the series. Between Kirk and McCoy's precise comedic timing and Spock's deadpan dry wit, some of these episodes wear much better than many of the dramatic shows. The Enterprise is kidnapped by the android Norman and taken to a planet in uncharted space that is ruled by Harry Mudd (Roger C. Carmel), who also appeared in Mudd's Women found on Volume 2 of this DVD series. Carmel was a familiar face on series television in the Sixties with appearances on The Man From Uncle, I Spy, Batman, Hawaii Five-0 and many others. Here, he overacts most effectively as a wily, rogue who attempts to get the best of Captain Kirk. The planet is populated with androids, led by Norman, who were created by visitors from the Andromeda galaxy and had dwelled on the planet for thousands of centuries without purpose. Mudd, in escaping previous troubles, had stumbled on to the planet and became the focus of their service. Tired of thinking up things for them to do, he helps the androids steal the Enterprise so that he could leave the planet. No explanation is really given as to why the androids could not have built their own space ship and left any time they wanted to, but let's leave that aside. Mudd's plan backfires when the androids make it clear that they no longer need him and will strand him on the planet with the Enterprise crew. Somehow, Kirk must defeat the incredibly efficient androids who offer a life of freedom from labor, incredible facilities and even immortality in the form of transferring a human brain to an android body. Kirk discovers that the logical androids have difficulty dealing with wild, illogical human thinking (these machines can never hack the real world!). Kirk and crew, joined by Mudd, battle back with some of the wildest scenes in the Star Trek canon. Random stuff: The android series' are portrayed by sets of twins. 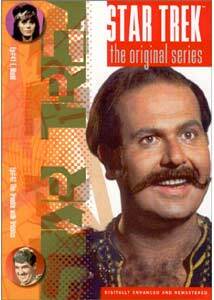 Carmel also portrayed Harry Mudd in the Star Trek animated series episode, Mudd's Passion. Scotty calls Mudd a "bogus frat." The scene between Spock and two of the Alice androids is priceless. Despite a few plot inconsistencies, this is a most enjoyable episode and fits well with its companion on this disc to make this a potently comedic Star Trek disc. This episode rates three Enterprises out of five. Spock: There's something disquieting about these creatures. McCoy: Oh? Don't tell me you've got a feeling. Spock: Don't be insulting, Doctor. Perhaps the best of the comic Star Trek episodes, The Trouble With Tribbles is ranked by many as one of the best of the entire series. Nominated for the prestigious Hugo Award in 1968 for best dramatic presentation, (along with 3 other Star Trek episodes that year) Tribbles lost out to the even more highly-regarded City on the Edge of Forever episode, written by Harlan Ellison. The writer of Tribbles, David Gerrold was recently interviewed here on dOc about his memories of working on Star Trek. The strength of this episode is the writing and acting. The Enterprise characters, from the top officers down to the crewmen who take shore leave on the space station, are very well-defined and make real contributions to the story. The supporting cast is excellent, with familiar faces and solid portrayals. The Enterprise is called to a remote space station that is involved in a dispute with the Klingons. Stored on this station is grain that will be used to develop a nearby planet and the Klingons are interested in not letting that happen. Kirk is given the responsibility of securing the grain and dealing with the Klingon ship that shows up. Thrown into this explosive mix is an innocuous little creature called a tribble, that seems to do nothing more than eat and breed at an amazing speed. This episode has some of the finest dialogue in the series. Several scenes are simply wonderful; the exchange between Kirk and Scotty, following the bar fight between members of the Enterprise crew and the Klingons, is especially top-notch and when Kirk and Spock realize that there might be a problem with the grain involving the tribbles is just great comedy. There is nothing else to say except: this is a classic, if you haven't seen it, check it out and if you have, watch it again. It's fun stuff. This episode rates five Enterprises out of five. Random stuff: William Schallert, who plays Nils Barris, is a very familiar character in movies and television; making literally hundreds of appearances including one recently on ER , as well as Family Law in the 1990s and as far back as Death Valley Days and Science Fiction Theater in the '50s. Charlie Brill, who portrays Arne Darvin, had an interesting footnote in television history as the act that followed The Beatles on The Ed Sullivan Show. Tribbles also make an appearance in the animated Star Trek episode, More Tribbles—More Troubles. In 1996, Star Trek: Deep Space Nine celebrated the 30th Anniversary of Star Trek in an episode entitled Trials and Tribble-ations. Footage from the original tribble show were combined with new footage via special effects that made it appear as if characters from both shows were interacting. Early in the show Kirk communicates with Admiral Fitzpatrick, who is played by Ed Reimers. He was well known in the '60s for his "You are in good hands with All-State" commercials. An outtake of this scene, which is a shot of a tribble in his hands as he intones "You are in good hands with tribbles," is a staple of the bloopers film seen at Star Trek conventions. Image Transfer Review: The DVD version of these programs surpasses every other format, including the original broadcasts. Blacks and colors are excellent throughout. The picture is great and at times excellent, with crisp tones and details. Audio Transfer Review: The audio is a rather subtly remixed DD 5.1 and, as with other episodes, is very well done. At times the theme music sounds a little harsh, but otherwise the sound is consistently fine. Dialogue is clear throughout. Extras Review: Same as it has been. Preview trailers, a booklet containing factoids and pretty good subtitles. This a must-have disc. Viewers of all ages and all types will find these episodes of the legendary original Star Trek series enjoyable again and again. They are great science fiction and great television. In fact, I think I will go watch it again.